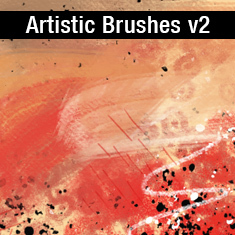 More than 50 brushes!, enough different from the previous pack. This brushes require a good machine because of the size of some and the use of “dual brushes” in other cases. Also some of these brushes use “Color Dynamics” (the leaves, for example) therefore you need to have selected a foreground color and a background.